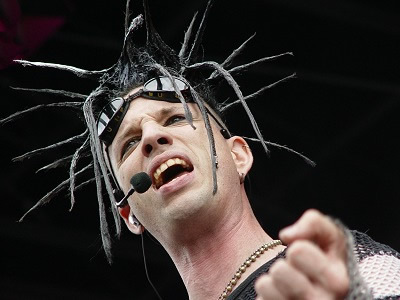 Skinny Puppy, The Sisters of Mercy, The Neon Judgement, Hocico, Gåte, The Klinik, Kiew, Qntal, Deine Lakaien, Combichrist, The Birthday Massacre... There were many reasons to get wet on this year's edition of M'era Luna. 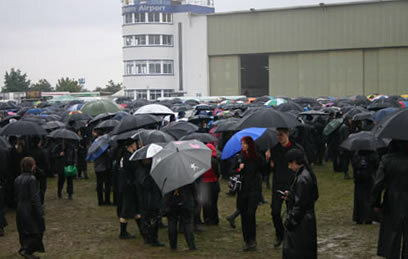 Besides the rain that turned the camping and festival area into small lakes and mud, M'era Luna 2005 attracted some 21 000 black-dressed goth, industrial, EBM and darkwave visitors with its impressive line-up. In total, some 40 bands gave it all on two stages in Germany 's Hildesheim on August 13-14. - We are very satisfied with this year's festival, even if we did not break last year's record of 23 000 tickets sold, says the festival's communication manager Mathias Petzhold. - All bands entered the stages as planned, although it was close that The 69 Eyes shouldn't make it in time. We are already looking forward to organise next year's festival, he continues. Trisomie 21 above, Qntal below. For me, the expectations on this festival started to grow some months ago when the first line-up wave was released. What if they have more than one stage and some of the concerts collide? And what if bands like Skinny Puppy cancel? There was no need to worry; after all M'era Luna is a German festival, and moreover one organised by the professionals FKP Scorpio. In the end all of the 40 announced bands turned up. And even if there were more than 21 000 visitors – mostly living on the camping-area, the queues to enter the festival area were neat. No chaos here! The first band out on my “must see”-list was Qntal, one of the best neue-folk bands there are today. Syriah on lead vocals spell bound the audience with her powerful and ethereal voice. Half of the songs performed came from the newly released album “IV Ozymandias”, and the rest were favourites of mine from earlier albums, like “ All for One” and “Flamma”. Unfortunately, Qntal – like many of the other bands performing on the smaller stage – had no time to sound check, so the first three or four songs were a little… experimentally performed. I had very high expectations on this gig, but I have to say that Qntal is a band that should be experienced live under other circumstances than this; poor sound quality in an old hangar. So I am really looking forward to the upcoming tour, where they will perform at “Shadowfest” in Stockholm . The festival takes place during two Thursdays (!) in November (10 and 17). Among the other neue-folk bands performing on the festival were Norwegian Gåte, who's lead singer Gunnhild Sundli touched all listeners with her elf-like appearance and wonderful voice. Then we had Faun and Shandmaul – that always show up on German festivals for the “black-lipped”-people. Another more or less standardised element on German festivals in this music category is Deine Lakaien, the legendary German darkwave band that will celebrate 20 years of fame in 2006. Alexander Veljanov, vocals, told me he is usually not even nervous performing for the German audience anymore – because he knows they just love Deine Lakaien and what they do. Their fans got to hear some songs from the new album “April Skies” like “Through the Hall” and a lot of old goodies. After some cheap tetra-packed wine I was ready for the next band on stage, The Crüxshadows. Always a safe card, Rogue, Chris Brantley and Rachel McDonell made a very well set performance, and Rouge was out surfing on the audience this time as well. Later on the same day we got some Finnish rock'n'roll from The 69 Eyes. At home, this is more of a gold-selling mainstream band, but today they were adding some “goth'n'roll”, and although The 69 Eyes were far from having the festival's highest BPM-rate they really got things moving. 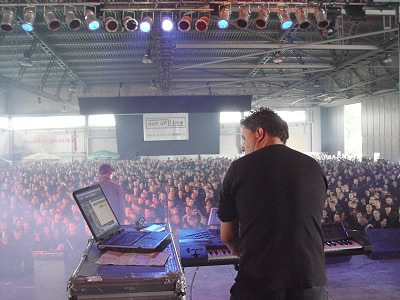 Talking of BPM – one of the festival's directions was EBM and powernoise. Combichrist delivered a really good gig, and Kiew got me going when he took up “DcDisk”. 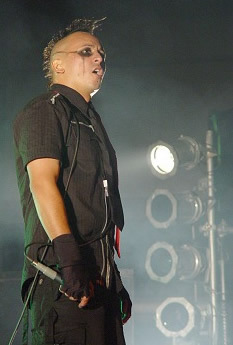 Hocico were mad as always and :SITD: made an energetic gig. And I have to say that Ronan Harris and his VNV Nation made a fairly impressive concert as well, filled with power and inspiration. One of the weekend's best concerts was undoubtedly the one with The Neon Judgement. TB Frank and Dirk Da Davo really gave the audience what we wanted: A great concert that brought us back to the good old days, spiced with their characteristic rock-ideology with fog, sunglasses, cigarettes and leather. With numbers like “Nion” and “Tomorrow in the Papers”, you just can't go wrong. Another real goodie was Skinny Puppy. I saw them twice last year and thought those gigs were fantastic. But I have to say they were even sharper this time. On the playlist were songs like “Tin Omen”, “Smothered Hope” and “Hexonxonx” – all in all more or less all you could wish for, except “Assimilate”. And the political messages were clearer than ever with faked homicides performed by American top-politicians on stage. 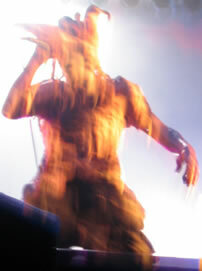 Like Skinny Puppy, The Klinik had a strong stage presence and energy, while playing “Murder”, “Moving Hands” and “Black Leather”. To sum up there were so many good bands that I haven't even had time to mention the fact that prevented the feeling of euphoria to appear. It came from above, and it came en mass. Rain. For all of you who have attended a rainy festival, comments are superfluously. I hope to be able to attend next year as well, preferably with better adjusted PA:s for the hangar stage and somewhat less rain. This was the best festival line-up I've ever seen.